CRM software has positioned itself as the essential tool for analyzing data about a customer’s history, thereby allowing businesses to learn more about their target audiences and effectively cater to their needs. Data is the essential ingredient that powers CRM and, consequently, all the different communication channels that provide this data, including a company’s website, telephone, email, live chat, marketing materials, and, more recently, social media. So, if we proceed with the assumption that CRM has become an indispensable tool for all businesses, then the priority becomes how to select the best CRM system for your business. This step is critical because it requires companies to navigate their way through the extensive maze of products in the marketplace. To survive this challenge, companies should be prepared with a selection strategy that closely aligns their short and long-term business goals with the product they ultimately choose. Most vendors have powerful sales and communication teams to promote their product, and the responsibility always rests with the buyer to promote and prioritize their own needs. Given the large number of CRM software vendors, each proposing and offering what they consider to be the “best of breed” product in the marketplace, what is the best strategy to align the company’s needs and priorities to the CRM products and their multiple features and functionalities? How can research conducted within and by the company help in this effort to select the best possible CRM product? Who, in the company, should be assigned to spearhead the selection process? Including the specific functionalities that would best serve the company’s objectives? How much time should be allotted to this selection process? Or should the process be fluid, allowing it to develop and finalize its goal without fear of meeting a deadline? Our analysis will provide you with an all-important jumping off point. It’s not intended to provide you with all (or any) of the answers about individual CRM products, but rather to offer you some guidance with regard to the important questions and issues to consider when making this decision for your company. Our survey of your peers is especially relevant as a source of information that comes to you in an unfiltered manner, and speaks to the real-life challenges and aspirations of their companies’ growth and success. Buyer Profiles: Who’s Looking for CRM and Why? 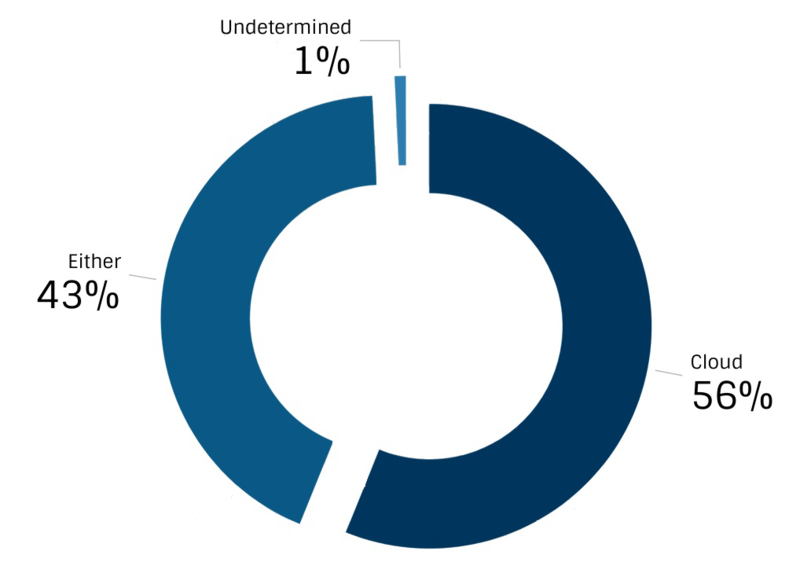 84% of the companies surveyed have under 1000 employees, with the greatest concentration found between 1 and 500 employees (refer to Figure 1). 75% also have an annual revenue between $1 and $50 million, with a concentration of 58% between $1 and $10 million. Together, these demographics reveal that 70% of companies have an annual revenue ceiling of $50 million and an average of between 0 and 500 employees with a maximum of 1000 employees (refer to Figure 2). The breakdown of companies in our business sample, by industry, is as follows: services represent the majority at 32%, followed by information technologies (IT) and manufacturing, both at 13%. As a point of clarification, many of the manufacturing companies that have an ERP system expressed the concern that the CRM features available in their ERP system were inadequate and opted to purchase a dedicated CRM system (refer to Figure 3). Why is This Important? How Does the Market Define this Category of Businesses? The most common way of defining business categories is by the number of employees and annual revenue. 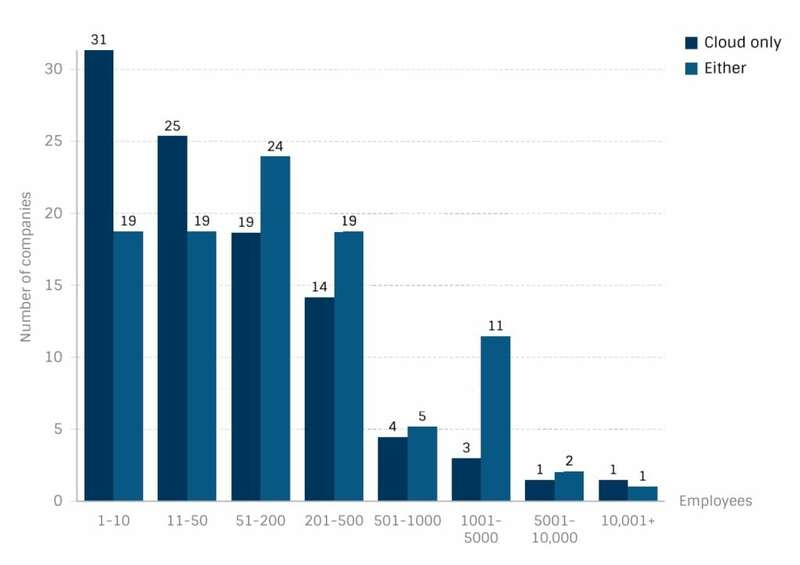 For SMBs, the number of employees ranges from 0-999, and they have an annual revenue between $5-$10 million. When it comes to choosing technology solutions that best fit your particular business, understanding how your business is classified is important. This is why many technology solutions are built with business classifications in mind, and have features and pricing that correlate to these business classifications. As such, let’s consider the following: small and medium-sized businesses (SMBs), are the backbone of the U.S. economy. They make up 99% of all firms, employ over 50% of private sector employees, and generate 65% of net new private sector jobs. SMBs account for over half of U.S. non-farm GDP, represent 98% of all U.S. exporters and are accountable for 34% of U.S. export revenue. This is undoubtedly a strong and influential group in the IT marketplace, and has resulted in a significant change of focus to the model of IT software. The new model focuses much more on consumer-friendly software products, rather than catering almost exclusively to companies in the enterprise sector. This initiated a flood of more cost effective and less complicated solutions, all geared to SMB needs. This is a great environment to be in when shopping for new software, especially if you’re in the SMB category and are poised to take advantage of the wealth of new, more reasonably-priced products with new options like cloud computing and subscription pricing models. With this in mind, it’s not a surprise that many businesses that had previously hesitated to both invest in software and take the time to research the best options are now doing so. But this is not to say that the process is without its challenges. It still makes good business sense to follow a set of principles that guide the selection process, and below we analyze our respondents’ views with regard to this process, and what lessons can be gleaned from their experiences. 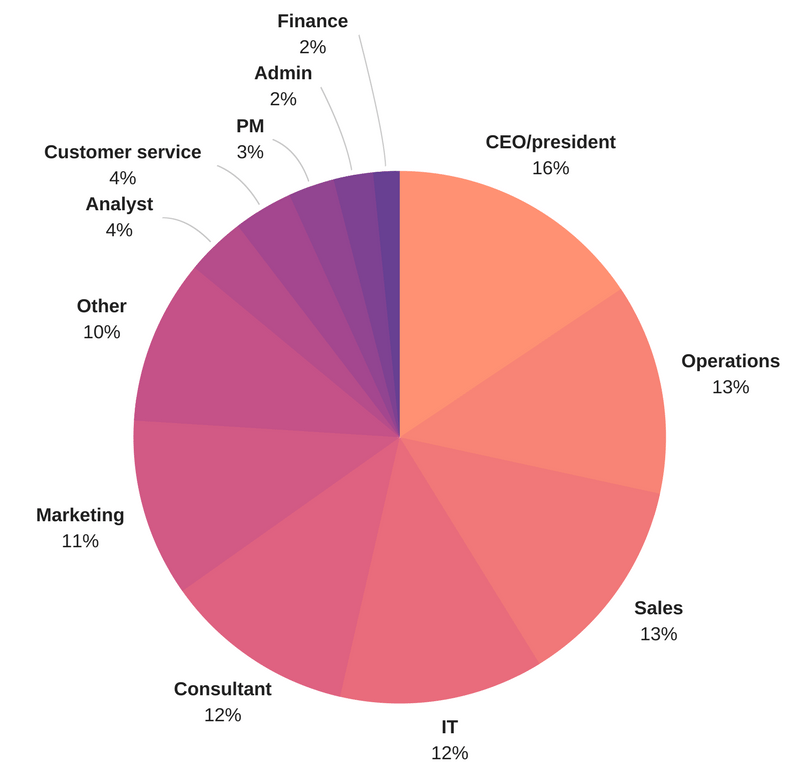 The graph above (Figure 4) represents the distribution of the software and tools used by companies to cover important CRM functions. In these choices, we can surmise that there was a lot of improvisation and creativity that took place. For example, using basic tools like Excel, Gmail, Outlook, and Office indicate that many of these options were used to build databases to store customer contact information and other such functions. Some respondents revealed using free versions of solutions like Hubspot, SugarCRM and Mailchimp, or adopting mainstream software like Salesforce and combining it with other tools to achieve different ends. Most companies reach a critical point in their lifecycle where they are obliged to closely examine and review two important areas of business behavior: increasing efficiency and optimizing operations. How this process unfolds is driven, in large part, by the strategies in place for businesses, as well as the commitment by management to successfully pursue them. These two objectives embrace many aspects of a business, but the investment in an IT solutions strategy is usually at the top of the priorities list. Consequently, the reasons articulated by our respondents for taking the decisive step to invest in a CRM solution are an attempt to address the issues of efficiency and optimization. The graph below (Figure 5) is a shopping list of grievances (in order of importance) that have been given, by companies surveyed, as reasons to invest in a CRM solution. Lack of functionality and centralization is at the top of the list at 22.75% and 17.25% respectively, but the remaining items on the list are also consequential, each with an average of about 10 to 15%. Most of the features in question are technological in nature, and are largely resolved by an efficient CRM system. The right CRM system helps set in motion a series of practices, strategies and technologies that enable companies to manage and analyze customer interactions throughout the customer lifecycle. This brings us back to our company survey and their list of grievances. Of particular significance is the fact that many of the reasons listed in the chart above relate directly to user experience. This, of course, is true for software in general. Issues such as the age of software, outdated applications and tools, user-unfriendly, and difficulty integrating applications all hinder the usability of a system and, ultimately, affect the day-to-day work routines of users. A CRM system must support the collection of data in an accurate and efficient manner. Using non-specific software and tools (as did the majority of our respondents) to complete this job created a mix of solutions that were difficult to use and maintain, and were highly inefficient. Data analysis, which is equally important, was difficult and inefficient to complete from multiple sources. As many industry analysts have noted, today’s CRM marketplace is saturated with choices, options, and pricing structures. But this has not translated into an easier selection experience for most buyers. Why? Lots of choice can add to product confusion, as well as a blurring of the priorities that are important to the buyer. The only way to combat this phenomenon is to come to this task well-prepared. Don’t skip thinking through and creating a sound selection strategy. CRM software can mean many things to many different companies. This highlights the fact that it’s important to first understand how your company prioritizes its needs, and how these needs are best served by a CRM system. Some pre-planning will ensure that the CRM tool you choose can grow with your business and continue to provide vital support for continued success. An analysis of the findings in the following section will be an indication of how our survey group responded to this challenge. Who’s in Charge of the CRM Selection Process? These findings are not exceptional in any way. The high participation rate of the president or CEO in small companies is probably explained by the fact that most small companies do not have IT or marketing departments, and most investment decisions rest with the president. Conversely, larger companies are more likely to have designated IT and marketing teams, so this decision would be delegated to one or both of these groups. This reflects a more traditional approach where larger companies delegate the CRM decision to departments that are more strategically involved in that decision. However, does the traditional approach produce the most beneficial results in terms of software selection for a company? Can you afford to leave out individuals involved in the front-line use of the system? It makes sense that those individuals will provide valuable insight and knowledge throughout the process. But stakeholders that are a little more peripheral to the system may have equally important input, as they will look at it from a different perspective. An approach that includes a team made up of a variety of stakeholders is by far the most effective method for choosing a software system. The advice of a consultant can help steer you through the selection process, but this shouldn’t happen at the expense of the rest of the team. In fact, the CRM selection process has become far more user-driven than company driven, thanks to the fact that the applications themselves are far less complicated than other software systems in the company. The market drive to appeal to a more consumer-driven model has also impacted the way selection decisions are made. There is a movement away from allowing the experts in IT departments to exercise complete control (due to their expertise), and turn towards the users themselves, as the software environment encourages their participation. What are Companies Looking For in a CRM system? Survey results that identify what companies want in a CRM system are pretty closely aligned with the reasons companies tell us they are ready to invest in a CRM system. Principally, they are an attempt to address the issues of efficiency and optimization that, at some point in the business cycle, confront all companies. The importance of functionality in a CRM software system is a given. All the basic functions (as identified in our graph) that make CRM run smoothly and efficiently were rated highly by respondents. Technology, an equally important component, shows a little more variance, with automation and integration identified as the most important features (Figure 8 below). Twenty-two percent of companies in our survey that are looking for CRM systems also say that they are looking for specialized features like project management, billing, donor management, membership, student information, and even logistics. This finding points to a significant evolution in the way of doing business, as well as the need to maximize and organize all the different ways in which information about a customer is available to companies. What, when and how often are customers buying? What might future purchases include? How sound is their credit history? Project management allows company reps to gain intimate insight into a customer’s priorities for their business, including personalized needs and points of irritation. All this type of information may have been available to a company in the past, but it was located and stored in multiple venues. The ability to access and share it from a central location changes the way in which business is conducted. Breaking down the information silos will increase overall efficiency, and contribute to a more productive company culture. Because these ‘alternative’ channels of customer information are far too important to ignore, many companies are turning to Data Analytics tools that are required to get that 360 degree profile. This new approach to gathering, sharing, and analyzing information represents a sea change in doing business, as we’ve noted, and our survey findings reflect this important change. No longer is CRM simply a record storing system, but, more and more, a system that will help users acquire the business intelligence to take tangible actions for their businesses. There were two delivery models considered by our survey respondents for their CRM systems: cloud and on-premise. Cloud CRM (or CRM cloud) means any CRM technology where the CRM software, CRM tools and the organization’s customer data resides in the cloud, delivered to end-users via the Internet. Alternatively, on-premise CRM software is installed on your own servers and controlled and maintained in-house. Our survey results revealed a definite preference for the cloud delivery model at 99% of respondents. However, 43% those were also willing to consider the on-premise model. Only one company expressed exclusive interest for on-premise delivery (refer to Figure 9). Medium to large companies show a greater propensity to consider both models (64%) and this is supported, in part, by the fact that many of them have larger IT departments and IT infrastructure in place that can be used to support an on-premise CRM (refer to Figure 10). If the software selection process has been tackled in a thorough and meaningful manner, the vendor selection should be relatively straightforward. In fact, a company’s business priorities drive the functions required and that should streamline the list of possible vendors. By adding budget considerations; level of training required and offered for employees; and software delivery models, the number of vendors remaining should be manageable. Selecting the right technology vendor is an important task for businesses. The right vendor needs to work with your company’s internal teams, which can be a complicated and emotional process, as humans interact with other humans. As mentioned earlier in this report, the recent boom in CRM software will make software selection both easier and more challenging. But the work that goes in before the final selection will definitely be rewarded. The results below (Figure 11) outline our client survey responses to questions about vendor viability and provide a point of departure with which to analyse them. Let’s begin this analysis by looking at the one vendor that stands out above the crowd of vendors, according to our survey group: Salesforce. They came out in front as the vendor with the highest number of company mentions, at 26%, the highest number of companies seriously considering this software and the highest number of companies using it, at 8%. This may not be a surprising finding, but it reinforces the market view and expectation of Salesforce. Founded in February 1999, Salesforce has grown into a company whose market capitalization tripled in five years, and quickly caught the attention of the bigger market players, leading to acquisition rumors involving names such as Microsoft and Oracle. Microsoft CRM also drew attention in our sample. 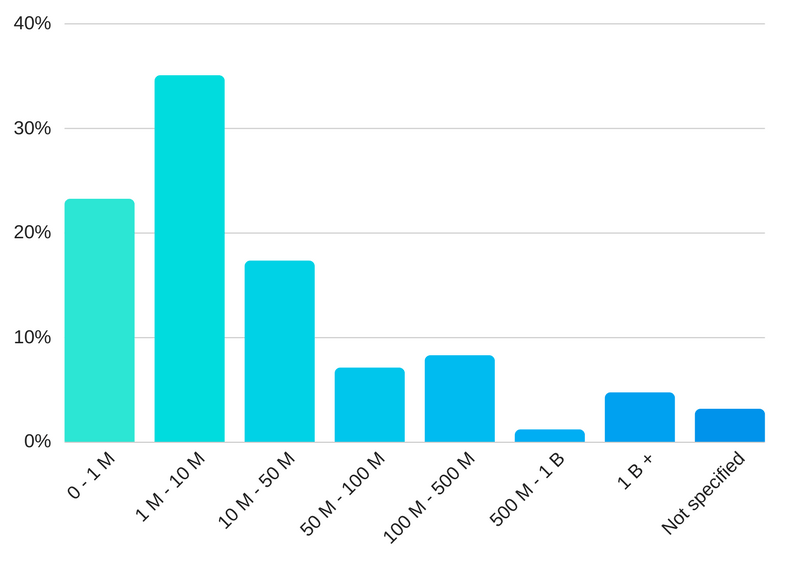 While not attaining Salesforce’s numbers, Microsoft CRM has also shown resilience with both SMBs (at 8%) and large companies with employee numbers greater than 1000 (15%). While Microsoft CRM has historically catered to the SMB market, they are steadily extending their reach to the global enterprise market. Helping aid that goal is the availability of Microsoft CRM in both a Software as a Service and on-premise model. SAP and Oracle are the primary competitors to Microsoft CRM in the medium and large company category, and both of these findings are confirmed by our survey results. 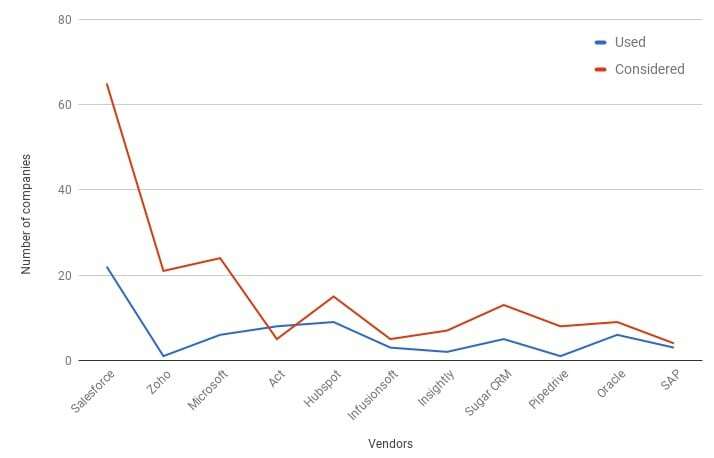 The final two vendors that are significant to our analysis are Zoho and Hubspot. These companies were in 2nd and 3rd place as possible vendor selections to the SMB market, although neither vendor scored well in the large company category. Zoho’s web-based CRM is designed to offer a low cost and quick CRM software solution, including providing a free trial model and starting solution. Zoho also covers a wide product scope of complimentary services due to its integration with over 20 other Zoho applications. Hubspot CRM is also promoting the simple-to-use, low-cost model but is additionally marketing itself as a CRM platform that allows sales teams to regroup quickly by not significantly changing their existing workflow. The number of respondents in the ‘other’ category is quite high, at 21% of total respondents. This category’s market share is larger than that of Microsoft. On reflection however, this number is possibly another indication of the market’s abundant number of products and its turn towards consumer-friendly models (detailed in Figure 13). Smaller vendors are more and more addressing consumer needs by creating quasi ‘niche solutions’ for many business scenarios, attracting many smaller and first-time buyers. The question regarding an appropriate amount of time required for the selection process is highly subjective, and differs greatly from one company to the next. The ideal objective is to allow the process to mature and develop as required and, at the end, have selected the best possible product that meets the individual company’s objectives. There really is no way to standardize this task. But the responses we received in our survey, for the most part, do not follow this formula. The most important consideration, according to our survey, appears to be speed with highly unrealistic expectations of what can be accomplished in a very short time period. Figure 14 illustrates the results of this question. 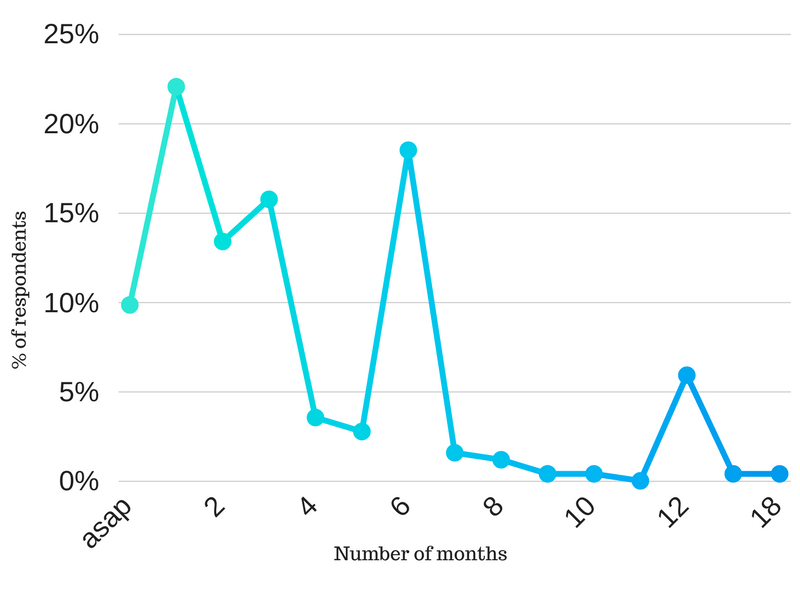 As is clear, the highest concentration of company responses is between “ASAP” (10%) and 1 to 3 months (22% at 1 month, 14% and 16% at 2 and 3 months, respectively), with two other small spikes at the 6 month (19%) and 12 month (15%) marks. With respect to the number of vendors that had actually been contacted, about 50% of companies did not contact any vendors. 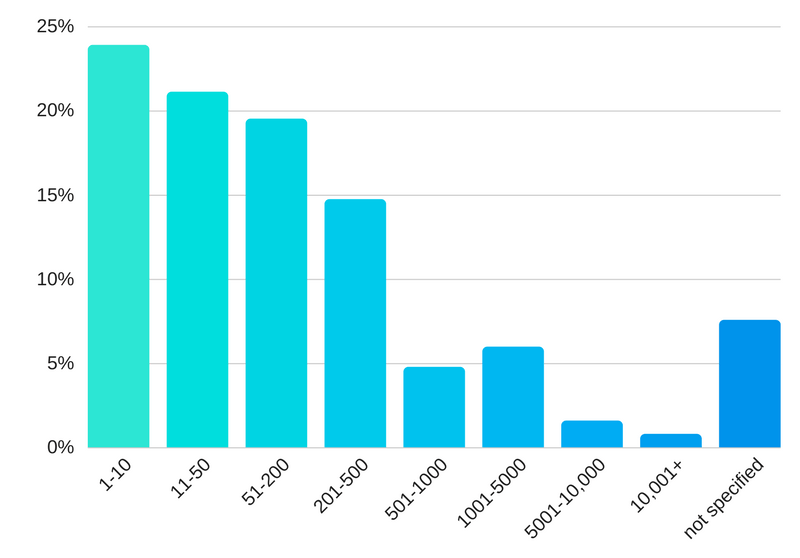 Among the respondents who wanted a selection made within one month’s time, 64% contacted either 1 or no vendors. While CRM software is less complicated than most other business software (for example ERP), an appropriate amount of time should be allotted to the task. Cutting corners in this stage of the process may result in a substandard product at a greater cost. Trying to shortcut this process is ultimately counter-productive. Many companies are conducting the majority of their research online, relying on websites, reports, and advice from peers. This may indeed work for some companies, but for most it’ll result in having to reinvest in software and repeat this process in a few years’ time. An investment in the time and resources needed to make a sound and fruitful software selection makes good business sense. While the average lifespan of a CRM product may be less than other software investments, purchasing an efficient system that enhances business productivity is worthwhile. Many factors can jeopardize the selection process, and we’ve discussed the most prominent ones. Supported by our survey results, we found that the overwhelming propensity was to focus on completing the task as quickly as possible without much thought for the outcome. It’s impossible to assess the quality of the results achieved by the respondents of our survey pool, but it’s probably safe to assume that greater effort in the research phase will produce better results. An inclusive process that listens to as many stakeholders as possible is always best, but maintaining a close eye on the features and functionalities that best meet your company’s priorities and business goals are critically important.